Michael Sam could become the first openly gay player in the NFL after coming out publicly to ESPN over the weekend. Sam finished his college career as a star defensive lineman at the University of Missouri and is eligible for the NFL draft in May. Several major American sports leagues have yet to feature an active, openly gay male player, and LGBT Americans have negative feelings toward pro sports leagues in general. 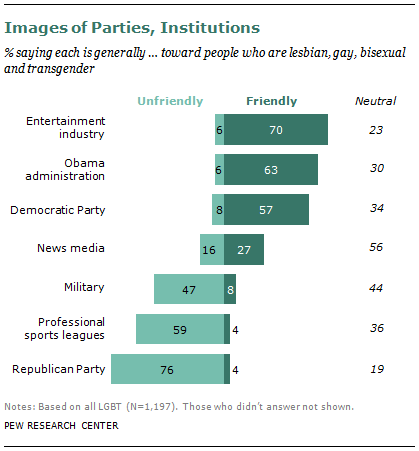 A Pew Research survey of LGBT adults conducted last year in the U.S. found that just 4% saw pro sports leagues as friendly toward LGBT people, while a majority (59%) saw the leagues as unfriendly and 36% saw them as neutral. Only 2% of LGBT Americans mentioned sports figures when they were asked about which public figures at the national level they saw as important to advancing their rights. Although Sam said his teammates at Missouri were supportive after he came out to them last summer, an article on Sports Illustrated’s website includes anonymous quotes from several NFL executives and coaches questioning the league’s readiness for an openly gay player in a locker room, with some predicting that Sam’s announcement could cause him to be selected later in the draft. Former NBA player Jason Collins announced that he is gay last year, but the 35-year-old center has not played in the league since his announcement.